Georgia Military Records dated April 5, 1838 show him as a Captain, from Carroll County. The Branch of service was not stated but the Georgia Militia was in operation during this time. A member of the Secession Committee from Haralson County who represented Haralson in the Secession Convention in Macon GA in 1861. He voted "Yea." He served as Representative from Haralson Co. in the Georgia Legislature 1877-78. This petition of Abner Walton, Loftin Walton, Jesse Walton, Martha Walton, James W. Featherston and Nancy his wife, Ransom Frederick & Joanna his wife, Mary, John, Samuel & Charley Woods children of Ezekial & Elizabeth Woods desc, who are minors, and in their behalf by their next friend the said James W. Featherston, and William son of John Stephens & Eliza his late wife who also is a minor & sues by his next friend the said James W. Featherston and children of Solomon Peed & Nicey his late wife. 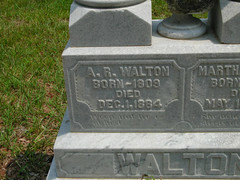 Respectfully showeth unto your Honor that Reuben Walton late of said County died intestate & without a wife during the present year leaving him surviving aforesaid petitioners, Abner Walton, Lofton Walton, Jesse Walton, Martha Walton, Nancy wife of the said James W. Featherston, & Joanna wife of the said Ransom Frederick his children & Mary, John, Samuel & Charley Woods children of Ezekial & Elizabeth Woods, both desc, which said Elizabeth was a daughter of said Reuben Walton...children of Solomon Peed & Nicey his late wife who also was a daughter of said Reuben Walton and William son of John Stephens & Eliza his late wife who also was a daughter of said Reuben Walton...grandchildren & only heirs at law upon whom his real estate descended between them to be divided as tenants in common. And your petitioners further show the said intestate was at the time of his death seized in fee simple of a tract of land situated in the County aforesaid & a part thereon leading from Leasburg to Roxboro adjoining the lands of John Harris, James Wagstaff & others --- said tract consisting of about three hundred acres. And your petitioners further show that they desire to have partition of said lands made amongst them according to their respective rights and interests therein, but that oweing to the size of the said tract of land, the number of the parties interested, the nature & quality of the soil, & other causes, it is impossible that actual partition thereof can be made without serious injury to the parties interested. Your petitioners therefore pray your Honor to order a sale of said land, on such terms as your Honor shall deem just & reasonable & that the proceeds of the sale may be divided among them according to their respective shares & interest, in the said land & may be paid to & secured for them according to law & the custom of this Honorable Court. Abner Walton, Loftin Walton, Jessee Walton, Martha Walton, James W. Featherston and Nancy his wife, Ransom Frederick and Joanna his wife, Mary, John, Samuel, and Charles Woods, heirs at law of Ezekiel Woods and Elizabeth his wife, and Wiliam Stephens, son and heir at law of John Stephens, and Eliza his wife, and the heirs at law of Solomon Peed and Nicey his wife. In this action it appears to the Court that Abner Walton, Loftin Walton, Jessee Walton, Mary, John, Samuel, and Charles Woods, and the heirs of Solomon Peed and Nicey his wife, are Defendants in this action, and that they reside beyond the limits of the state of North Carolina, and that their places of residence are not known to the Plaintiff. It is, therefore, ordered that publication be made in the New North State, a newspaper published in the city of Greensboro for six successive weeks notifying the said above Defendants of the filing of said petition, and summoning the said Defendants to be and appear at the next term of the Superior Court to be held for the county of Person at the court house in Roxboro in said county, on the sixth Monday after the first Monday in March, A. D. 1874, then and there to plead, answer or demur to said petition. And let the said Defendants take notice that if they fail so to do the said cause will be heard exparte as to them, and judgment granted according to the prayer of said petition. And further, this action shall be independent to personal service of the summons on said absent defendants. Given under my hand and the seal of said court, this 14 day of Feb., A. D. 1874. Source: New North State, 4 March 1874.